Choose a page number to find the recommended websites and downloadable pictures for this book. Scroll down and click on an animal, or click on "Habitats" or "Regions" at the top of the screen. How do basilisk lizards run on water? Click on "Tigers like to swim". A dazzling tour of the animal kingdom covering all four corners of the globe, from tiny bugs on Himalayan peaks to hairy rhinos in the depths of the jungle. Reveals the magic and wonder and vast variety of animals that share our world, with lively, fascinating text and stunning full-colour wildlife photography. Arranged by continent, it shows the amazing ways that animals have adapted to different environments. 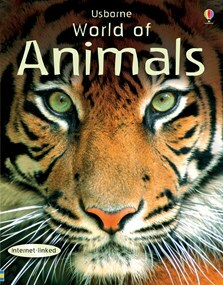 Includes fascinating facts, animal records, a comprehensive glossary and links to websites with video clips of animals in their natural habitats, games and much more. The best book for children. Usborne's World Of Animal reference book is an awesome encyclopedia for beginners.The information is easy for young children to read and the stunning photography is very nice for them to look at. Besides than a reference book, I can search the internet based on its internet-linked and download pictures, play games and much more from this book.